Combining the cool sweetness of mangoes with the fire of habaneros, Vanee Mango Habanero Sauce adds a sharp kick to whatever it's paired with. It is perfect for wings, seafood, meatballs, poultry, and as a dipping sauce. 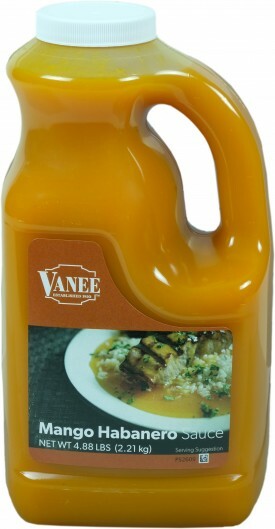 Vanee Mango Habanero Sauce comes conveniently packed in half-gallon, pour-friendly jugs; simply pour and serve. It has no high fructose corn syrup to get in the way of its authentic taste, texture and appearance. Each 64 oz. jug has about 111x 2 Tbsp. servings, for a total of 444 servings per case. Perfect for chicken wings, seafood, meatballs, poultry, or as a dipping sauce. Water, Sugar, Mangos, Habanero Puree (Salt, Citric Acid, Sodium Benzoate, Natural Flavors), Food Starch - Modified, Lime Juice Concentrate, Salt, Carrot Powder, Citric Acid, Beta Carotene, Xanthan Gum, Potassium Sorbate and Sodium Benzoate (Preservatives), Spice, Oleoresin Turmeric.